I saw this on a blog I check out regularly. I think it is the coolest thing ever!! I designed my very own font, using my very own handwriting! It's available here, and it's free. 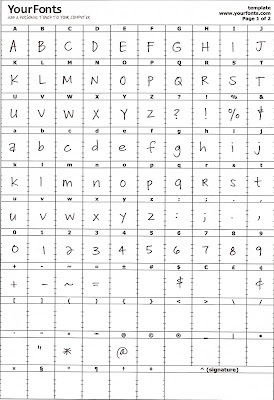 You simply print a template, fill out the squares in your handwriting, scan it into your computer & viola! I uploaded it to my computer. So, now everything I do is in my handwriting. that is so cool!! i want to do that. I love you handwriting!